On Wednesday, March 27 from 6pm to 8pm, the City of Palo Alto is hosting a community meeting that will review a popular but challenging option to separate the Caltrain tracks from city streets.Â Â The community meeting will inform a Council decision process that has beenÂ lengthened until OctoberÂ to incorporate feedback of a stakeholder group to consider funding strategies. Earlier grade separation options for the Churchill crossing that would have required property takingsÂ had beenÂ taken off the table after very strong community objections to any option that would require the taking of homes. 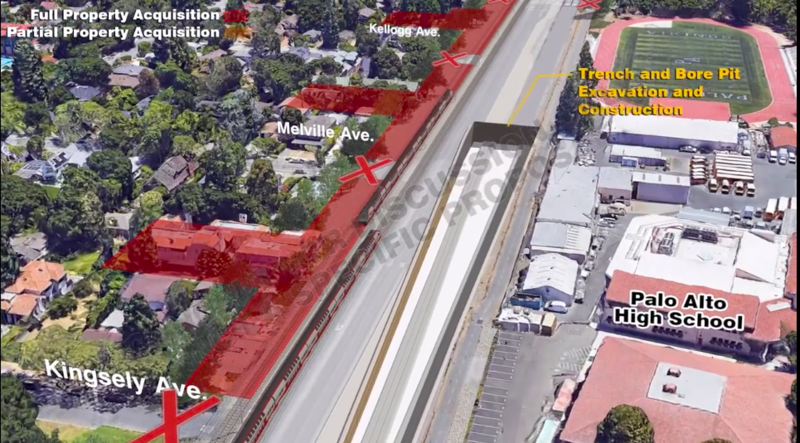 At last Monday’s city council meeting, community members whose homes would be taken by the tunnel design similarly pleaded with City Council to eliminate this option. Earlier descriptions of this community meeting indicated that the agenda would also consider the South Alto Trench option which would move the train tracks to a trench running beneath Meadow and Charleston streets from the tracks. The latest analysis of the South Palo Alto trench option showed significant drainage challenges, as the proposedÂ trench would cut through Matadero and Adobe Creeks. Pumping stations would need to be installed that would need to continuously pump all the water whenever the creeks are running. Caltrain has indicated that because a trench design is not needed for transportation and safety purposes, they would not pay for the operating costs of continuous pumping, leaving the cost of continuous pumping for the cityâ€™s budget. The citywide tunnel also faces financial challenges.Â Â An earlier report had indicated that the cost of the designÂ would be in the range of $3Billion to $4Billion, while a South Palo Alto trench would cost in the range of $750Million to $1Billion. How might the options be paid for?Â At the last Community Advisory Panel, the community members were presented a set of funding options that focused on a variety of forms of business taxes, but did not include theÂ property tax and land value capture options that had also been described in the earlier report.Â Â WhileÂ the CAP presentation showed the business tax options, it did not show the amount of money that might be raised byÂ theÂ tax options, and how the attainable funds compared to the cost of the proposed project, unlike theÂ earlier report, which did sketch out how much different tax options might raise. At last Monday’s City Council meeting, business leaders including Chamber of Commerce head Judy Kleinberg, expressed concerns that the business community had not yet been consulted, and wanted any further discussion of business taxes to be held off until a stakeholder group including businesses had a chance to discuss options.Â Â Council agreed that a stakeholder group should be convened, and decided to extend the decision til October to leave time for the stakeholder process and funding discussions. A funding discussion including business taxes should surely include the business community. When Mountain View passed its recent Measure P business taxÂ to fund local transportation and housing needs, the city developed the tax options with substantial consultation with the business community.Â Key groups, including the Silicon Valley Leadership Group and the Mountain View Chamber of Commerce expressed concerns and did not support the tax – but they also did not campaign against it.Â A tax measureÂ isÂ much more difficult to pass if there is a strong, funded opposing campaign. However, we hope that the valid desire for a stakeholder group to discuss funding options in detail doesn’t preventÂ the costs and funding options from being presented at Wednesday’s community meeting.Â And aÂ variety of funding mechanisms, as analyzed earlier, should be presented.Â Community members need to have the chance to look at the price tags of the trench and tunnel options, to start to assess whether the community has an appetite for these sorts of significant expenditures.Â Then the stakeholder group can dive into the details. The upcoming meeting on Wednesday will be an importantÂ oneÂ where community members will have a chance to react to the options – and significant challenges – of the citywide tunnel and perhaps the trench options.Â The meeting will also cover the Churchill Ave crossing and traffic data.Â So please come if you are concerned about Palo Alto’s grade separation choices. The meeting will be held onÂ Wednesday, March 27, 6pm-8pm, at theÂ Mitchell Park Community Center El Palo Alto Room, atÂ Â 3700 Middlefield RdÂ in Palo Alto. Will they solicit gofundme donations at the meeting?